UDM Downloads > Volley Balley (PalmOS)! Beach volleyball is always pleasant. Shining sun, emerald sea, summer vacations:The volleyballies that play this rather funny game will help the player to recollect the best moments of the summer vacations or to while away the time till the moment, when he will put his feet on the sea-coast and will play beach volleyball receiving a perfect suntan and ton of pleasure (including the one from recollecting our volleyballies). The object of the game is for each player to send the ball regularly over the net to ground it on the opponent's court, and to prevent the ball from being grounded on its own court. A point is added to the player's score every time when the opponent drops the ball or hits it more then three times in a row. In the game we used the sideout scoring system. A player wins a game by scoring 15 points with a two-point advantage - this is a classic scheme. We complicated it by the feature when the winner receives additional 1000 points for the points advantage, and if he won for less than 15 minutes, 10 points are added for every second left. Smooth 3D animation, realistic physics and striking dynamism - these are the main features of this game. Several levels of difficulty will not let you get bored waiting for the beach season to come. Moreover, you have a possibility to grow professionally here: move from Novice to Expert and Master of Volley Balley. 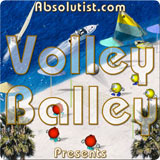 New exclusive game mode - join and win the volley World Cup! Do you like active sports? Do you like travel, sea, sun and incredible show programs? If you do, then you came to the right place! We offer you a chance to feel the mood of Olympic Games!